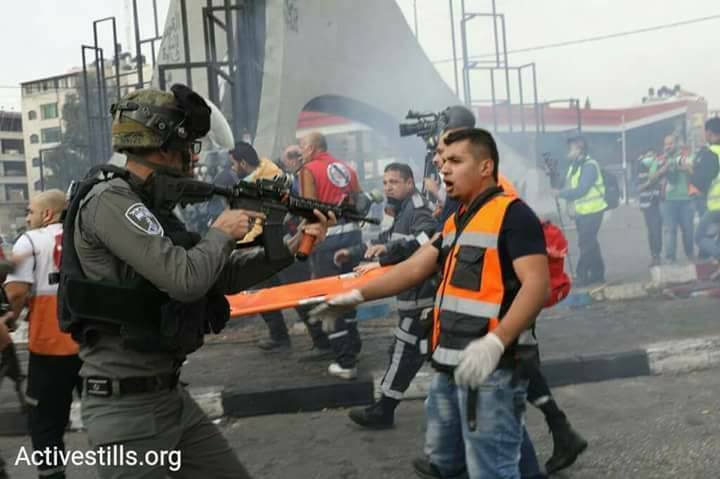 Israeli Occupation Forces (IOF) on Saturday quelled a rally that kicked off in Bethlehem after approaching the northern entrance to the city. Local sources told the PIC reporter that the peaceful march followed a press conference by a number of Christian clergymen who expressed their refusal of the US President Donald Trump’s decision to recognize Jerusalem as capital of Israel. 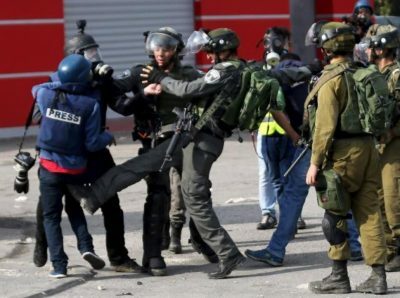 IOF soldiers showered the marchers with tear gas canisters leading to the injury of Hisham Abu Shaqra, the cameraman of Anadolu News Agency, who suffered suffocation while covering the event. Dozens of Palestinians were injured on Friday in clashes with the Israeli occupation forces (IOF) in different areas of the occupied West Bank over the US recognition of Jerusalem as the capital of Israel. A large demonstration was launched in the courtyards of al-Aqsa Mosque in which the participants raised banners condemning the US move. Violent confrontations broke out at the northern entrance to al-Bireh city where dozens of Palestinians, including a press photographer, chocked on tear gas. A number of Palestinians were also injured by the IOF fire in protests organized in Budrus village to the west of Ramallah city. 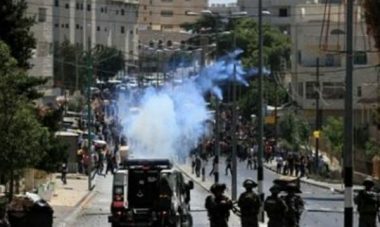 The PIC reporter said that three Palestinians were injured with rubber-coated metal bullets while two others suffered live bullets injuries in the confrontations that erupted at the northern entrance to Bethlehem city. Other clashes flared up in al-Arroub refugee camp, Bab al-Zawiya area and Beit Ummar town in al-Khalil province following mass demonstrations organized by Islamic and national forces. The IOF opened fire at a Palestinian vehicle in Halhul town in al-Khalil which, as the Hebrew website "0404" claimed, attempted a car-ramming attack against Israeli soldiers. Clashes extended to the south of Sa'ir town and to the northwest of Halhul where the IOF soldiers fired tear gas canisters and rubber and live bullets at the Palestinian youths who responded by throwing stones. According to the PIC reporter, two Palestinian youths were injured, one of them seriously, with rubber-coated metal bullets in confrontations with the IOF in Salfit. 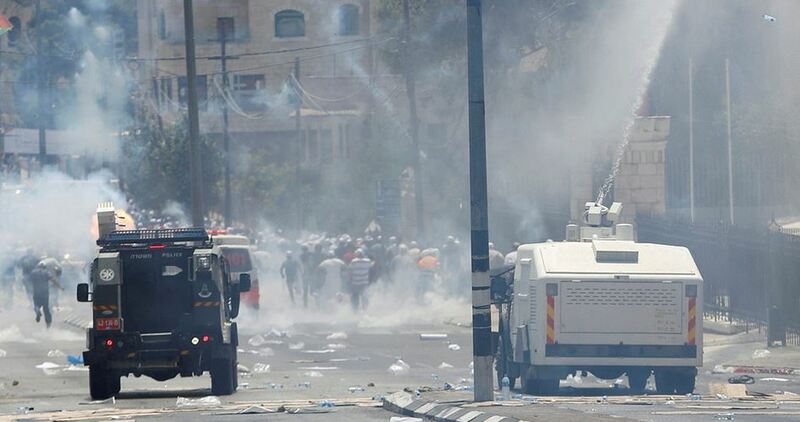 Dozens of suffocation cases were reported in violent clashes in different areas of Qalqilya. Local sources told the PIC reporter that other clashes broke out in Azzun town to the east of Qalqilya city and that the IOF soldiers blocked the main entrance to the town and attacked the Palestinian citizens with tear gas canisters. Similar confrontations were witnessed at Huwara checkpoint, Beit Furik town and Deir Saharf town in Nablus province. The IOF arrested two Palestinian youths at the Beit Furik entrance, handcuffed them and took them to an unknown destination, according to eyewitnesses. The PIC reporter said that seven Palestinian youths were injured in clashes with the IOF soldiers who broke into al-Lubban ash-Sharqiya village to the south of Nablus and fired tear gas canisters at the Palestinian citizens' houses. Director of the emergency department at the Palestinian Red Crescent Society in Nablus, Ahmad Jibril, told Wafa news agency that ten Palestinians were injured with rubber bullets in the confrontations that erupted in Beita town to the south of Nablus. Jibril added that two Palestinians were injured after being shot with live bullets, six others suffered rubber-coated metal bullet wounds while dozens choked on tear gas in Huwara clashes. In the same context, violent clashes broke out between Palestinian protesters and the IOF in Tammun town to the east of Tubas city, local sources reported. Clashes escalated in the vicinity of Kadoorie university in Tulkarem after a mass demonstration protesting the US decision arrived at the western entrance to the city. Local sources told the PIC reporter that the IOF soldiers closed the entrance and heavily fired sound bombs and tear gas canisters at the demonstrators. 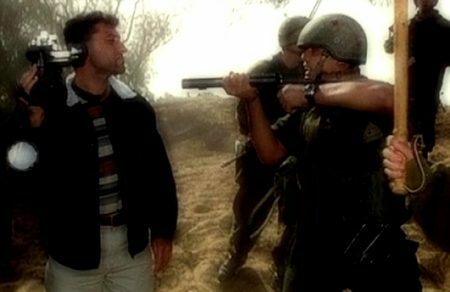 The Israeli soldiers severely assaulted a number of Palestinian citizens and journalists and prevented them from approaching the checkpoint area. Meanwhile in Jenin, many Palestinians suffered breathing difficulties after inhaling tear gas in the clashes that flared up in Silat ad-Dhahr village. Local sources said that the IOF soldiers fired live bullets and tear gas canisters at the Palestinian youths who responded by throwing stones and setting tires on fire. Israeli soldiers attacked, Saturday, a nonviolent procession in Bethlehem, assaulted many reporters and tried to prevent them from documenting the unfolding events. The procession was organized by the Coordination Committee of the Palestinian factions, and started in front of the Palestinian Women’s Union, in the Cinema Street, in Bethlehem city. The soldiers started firing gas bombs and concussion grenades at the marchers, and attacked many reporters, in an attempt to prevent them from doing their jobs. The procession is part of ongoing activities and massive popular protests denouncing Donald Trump’s illegal recognition of occupied Jerusalem as the capital of Israel, and his preparation to move the American Consulate from Tel Aviv to the occupied city. It also commemorates the fiftieth anniversary of the establishment of the leftist Popular Front for the Liberation of Palestine (PFLP). It is worth mentioning that the soldiers have abducted hundreds of Palestinians, injured thousands, and killed eleven Palestinians, since Trump made his illegal announcement, in direct violation of International Law and all related United Nations and Security Council resolutions, in addition to one child who died from serious wounds he suffered in 2014. On Friday, the soldiers killed four Palestinians in the West Bank and the Gaza Strip, and injured at least 367. The slain Palestinians have been identified as Mohammad Amin Aqel, 19, from Beit Ola, in Hebron, in southern West Bank, Bassel Mustafa Ibrahim, 29, from Anata town, northeast of Jerusalem, Yasser Sokkar, 23, from Sheja’eyya, east of Gaza city, and Ibrahim Abu Thuraya, 29, from al-Boreij refugee camp, central Gaza. On December 12, 2017, the soldiers killed three Palestinians identified as Mustafa al-Sultan, 29, from Beit Lahia, in the northern Gaza Strip, and Hussein Nasrallah, 25, from al-Karama neighborhood, northwest of Gaza city. One woman, identified as Hamda Zubeidat, 60, from Zubeidat, north of Jericho, died of a heart attack, on December 12, when Israeli soldiers hurled concussion grenades near her, just as she opened her door. On December 9, the soldiers killed Mohammad as-Safadi, 25, from ad-Daraj neighborhood, in Gaza city, and Mahmoud at-‘Atal, 29, from Sheikh Radwan area in Gaza city, after the army fired missiles at them. On December 8, the soldiers killed Maher Atallah, 54, from Beit Hanoun, in the northern part of the Gaza Strip. On December 7, the soldiers killed, Mahmoud al-Masri, 30, from Khan Younis, in the southern part of the Gaza Strip. It is worth mentioning that, on December 6, 2017, a Palestinian child, identified as Mohammad Saleh Abu Haddaf, 4, died from serious wounds he suffered on August 8, 2014, when Israeli army drones fired missiles at his family’s home, and several nearby homes, in al-Qarara town, north of Khan Younis, in the southern part of the Gaza Strip.